This site will acquaint you with some basic facts about the best places to retire in Hawaii. Hawaii is the tropical island paradise where many active adults over 55 dream about making their retirement community. In fact an August 2007 Harris Poll indicated if baby boomers had to live somewhere other than their home state, Hawaii is the state where they would prefer to live. The Aloha State offers a year round steady warm climate, some of the greatest scenery in the world, and unlimited things to do. On the downside, living in paradise tends to be quite expensive. It is extremely desirable and that, along with being an island distant from the mainland, makes real estate and almost everything else tend to be high-priced. Travel back and forth to the continental U.S. is also expensive and inconvenient. The growing population was over 1.4 million in 2015. Updated 11/2016. The Hawaii climate is characterized as tropical . The temperature is always warm except at the tops of its large mountains, where it can even snow. In 2011 the Hawaii the median household income was over $68,200 in 201-2014, well above the national median of $53,000. Real estate and almost everything else is very expensive - on the MERIC index it is ranked the most costly state in the union. The Zillow Home Value Index in mid 2016 for Hawaii was $571,500. The average home price in Honolulu in mid 2016 was a staggering $725,200 (NAR). Tax Burden: According to the Tax Foundation, at 10.2% Hawaii has the 14th highest tax burden in the country. Taxpayers here pay $4396 per capita in state and local taxes. Retirement Income Exemptions. Military, federal, state/local, and some private pensions are exempt. So are all out-of-state government pensions. Social security exemption. Social security is exempt. Sales Tax: Sales tax is 4%, although Oahu adds an additional .5%. Property Taxes: Property is assessed at 100% fair market value. Personal property like cars is not taxed. Per capita property tax paid is $943. Homestead Exemption. The homestead exemption is $12,000, and $40,000 in Honolulu. People over 70 get an exemption 2.5 times higher. Estate and/or Inheritance Taxes. There is an estate tax on estates over $3.5 million that ranges from .8 to 16% (on estates over $10MM). Non-residents have a much smaller exemption. Link to Hawaii Department of Taxation. Hawaii does not have a certified retirement community program. 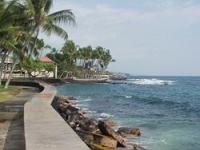 Some cities and towns in Hawaii are extremely popular as retirement communities. Hawaii is made up of several islands of different sizes. There are some very different types of places to live in retirement, even on the same island. Kauai and Maui are very different than the more developed Ohahu (the island where Honolulu is located). The Big Island of Hawaii has a very different feel in its different parts - dry and volcanic on the west and wet and lush on the east near Hilo. The smaller islands of Lanai and Molakai are mostly undeveloped. - Hilo - This delightful town is perched above the Pacific on the eastern side of the Big Island. It is rainy here but a place of great beauty and some diversity. - Maui - Many people's favorite place to retire because of its beauty and fabulous beaches. There are many lovely communities in Maui.